Ambulance Ride-Along Toolkit - American Ambulance Assoc. Ambulance Ride-Along Toolkit - American Ambulance Assoc. 2018 Ride-Along Toolkit Now Available! Educating your members of Congress about ambulance industry issues makes them much more likely to support your efforts. 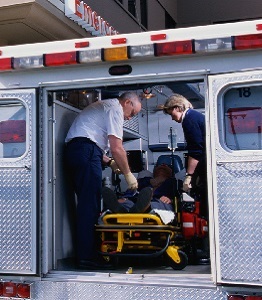 An easy and effective way to educate them is to invite them to participate in a local Ambulance Ride-Along! Congress is scheduled to adjourn on July 28 for their August congressional recess with members of Congress returning home to their districts and states. This is the perfect opportunity for you to educate your members of Congress about those issues, in particular Medicare ambulance relief and reform, which are important to your operation. The most effective way to deliver these key messages is to host your member of Congress or their staff on a tour of your operation and an ambulance ride-along. If you cannot host a tour and ride-along, we strongly encourage you to arrange local meetings with your members of Congress during August. The AAA has made the process of arranging a ride-long or scheduling a meeting easy for you with our 2018 Congressional Ride-Along Toolkit. Are you willing to host a Member of Congress at your service but unsure of how to set it up? Email Aidan Camas at acamas@ambulance.org and Aidan can help you set up a meeting. Everything you need to arrange the ride-along or schedule a meeting is included in the Toolkit. Act now and invite your elected officials to join you on an Ambulance Ride-Along! This entry was posted in Government Affairs, Member Advisories, News, Press and tagged 2018, Ambulance Ride-Along Toolkit. Bookmark the permalink.